The Cross Wreck is named after a huge Christian cross pointing out the spot where the first missionaries landed. 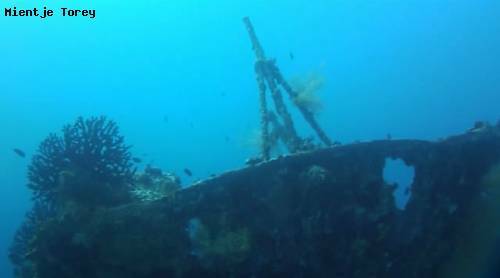 The Cross Wreck is one of Raja Ampat's more accessible wreck dives. It lies close to shore in just 18 meters of water. It is named after a large cross on the shore nearby where Christian missionaries first landed in Irian Jaya. The wreck was a Japanese Navy Patrol Boat that sank during World War II. It now sits upright in the sand and is completely covered in soft corals and encrusting sponges. Two rows of depth charges can be seen at the stern and the ships lamps are still either standing in their places or laying on the deck. Ammunition can be seen in the front hold by divers qualified to penetrate the wreck. The switchboard can be seen in the communications room and penetration into the engine room is also possible by suitably certified wreck divers. The wreck is a popular night dive where lionfish, scorpion fish moray eels and parrotfish can all be seen. Critters are all over the wreck including numerous nudibranch, shrimp and goby species. Huge Napoleon wrasse and parrotfish can also be seen. Critter Corner is a little sand/rubble area at the end of the Cross Wreck towards the beach that is a good place to spot leaf fish, frogfish and seahorses. The Cross Wreck (S00˚53.428', E134˚05.420') I know is near Pulau Mansinum (Missionaries Island) in Manokwari, West Papua. P. Mansinam is a picturesque little island with a small village, a pleasant beach, and ruins of an old church, a memorial of two German missionaries, Ottow and Geissler who settled on Mansinam on 5 February 1855. There is a large concrete cross standing on the island, marking the landing spot of the first two Christian missionaries. Just outside the cross rests a wreck Japanese warship (about 15m long) on the sand bottom.